The Google algorithm is the reason why certain websites appear on the first search results page and some can barely be found after the fifth. Understanding how websites are assessed and what Google algorithms and updates are released periodically is important in order to explain why the first results page looks the way it does. Search engines normally display results in order of relevancy, and originally this was calculated mainly by using the number of keywords on a page. 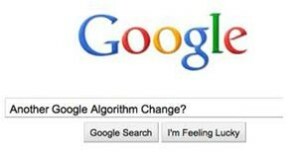 However, they frequently release Google algorithm updates to weed out links to websites that are cheating and are not as relevant as they seem when following the mathematics used by the first version of the search Google algorithm. There are numerous updates a year, sometimes climbing up into the hundreds but occasionally major updates are released which impact the results page to a larger extent. Cassandra update: April 2003 – The main changes at this time included introducing hostility to hidden text on webpages, as well as hidden links. The update impacted a fairly large network of co-owned domains linking to each other. Fritz update: July 2003 – This change replaced the frequency of updates for the index from monthly to daily, bringing the Google Dance to an end. Florida update: November 2003 – This update made most of the original search optimisation practices such as keyword stuffing less relevant. Austin update: January 2004 – Google took the fight against keyword stuffing one step further and released an update which prompted discussion about major changes in the algorithm in favour of relevancy in results. Brandy update: February 2004 – Keywords became even less important as the Google algorithm now had a better understanding of semantics and the power to assess synonyms. XML sitemaps update: June 2005 – This algorithm change gave webmasters more control over indexation by allowing them to submit their own sitemap to Google Webmaster Tools. Personalised search update: June 2005 – Google could now tailor the first results page after tweaking the Google algorithm to include the search history of each user, thus ensuring the relevancy of results. Google Maps update: October 2005 – This update was introduced to favour local searches and to encourage business owners to update their information on the maps. It also helped deliver more relevant results to queries by merging Google Maps data with the Local Business Centre service. Jagger update: October 2005 – Google rolled out changes in the Google algorithm that devalued paid links, link farms and reciprocal links, proving that the fight against search engine optimisation practices that were seen as spam was still ongoing. Supplemental update: November 2006 – The Supplemental Index went through a number of structural overhauls, most of which affected filtered pages. Universal Search update: May 2007 – This update saw the introduction of news, images, videos, and more into the search engine’s results page. Dewey update: March 2008 – This wave of changes generated a lot of heat from webmasters, but its main impact was that two servers offered different output for the results page. There was also some speculation of Google using this update to enhance other services like Google Books. Vince update: September 2009 – It was considered minor by Google but caused a bit of a stir among professionals in the field. It was meant to factor in trust when displaying search results, but many felt it favoured established brands over independent content creators, and some even nicknamed it “the brand update”. “May Day”: May 2010 – This update hit search engine results and was meant to decrease the relevancy and effectiveness of long-tail keywords. These keywords come under the form of highly specific phrases used when people search for special content. Caffeine update: June 2010 – Caffeine was a new way of creating the search index by integrating crawling and indexation in a much tighter way. The infrastructure update offered more real time results, and made the search index up to 50 percent more up to date. Google Instant: September 2010 – Expanding on the introduction of the suggestion dropbox, Google Instant added search results in real time based on the suggestions generated whilst a query was being typed. Its impact on the results page was smaller than expected before the roll-out. Instant Previews: November 2010 – Google gave its users a preview option for results which allowed them to view a thumbnail of the website’s front page before following the link. Social signals: December 2010 – Social media became more relevant in indexing techniques when both Google and Bing rolled out updates to take social networking into account when determining page rankings. Google Algorithm Panda: February 2011 – The main change of 2011 came with the continued series of Google Panda updates, which refresh and shuffle up to this date. Panda affected up to 12 percent of results, and aimed to focus on the quality of web pages it linked to by using enhanced artificial intelligence based on human quality testers and their criteria. New ranking factors were introduced based on the human assessors’ definition of what makes a quality website, and Google now also assessed a website as a whole as opposed to just individual pages. The update also penalised websites who overindulged in search engine optimisation, as well as websites that carried a lot of advertising. Google Algorithm Penguin: April 2012 – Google took the fight against SEO to a new level and released an update focused solely on identifying and punishing websites that broke the Google Webmaster Rules and were found to be spamming. The Penguin update was rolled out to catch websites using techniques such as keyword stuffing, link schemes, etc. It was especially tough on bought links, but websites flagged up by Penguin had a chance to redeem themselves by using the Google disavow links tool and gain a second chance. DMCA Penalty: August 2012 – This update pushed down the search results list websites suspected of copyright infringement. Exact-Match Domain update: September 2012 – This wave of changes penalised websites with URLs that matched search keywords but did not have enough relevant content on their pages. Google Hummingbird: August 2013 Google introduced Hummingbird, an almost entirely new algorithm, in the biggest change to the search engine for since it’s existence. Google RankBrain: October 2015 – RankBrain is the code name for Google’s new artificial intelligence system that analyses page content and tries to put the content into context.